Note: Only the Xbox 360 version of the game was played in preparation for this review. Rarely does a turn-based strategy game draw my attention. I often lack that extra psychological *thing* that it takes to plan turns ahead of time, rather than focusing only on what’s directly in front of me. But then a game like Skulls of the Shogun comes along, and presents its systems in a way that makes vanilla players—like me—can easily get the hang of it. 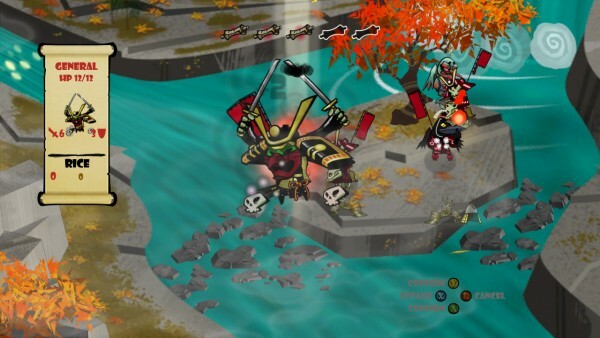 But don’t let the game’s accessibility fool you, for–like any good strategy game—Skulls of the Shogun gradually builds on its gameplay in interesting ways to make a much deeper, and harder, intellectual challenge. It’s the kind of game I wouldn’t mind spectating a match of. The first thing you’ll be hit with in Skulls of the Shogun is it’s look. It’s hand-drawn Asian cartoonish art style is a delight to look at, from it’s character art to the beautiful landscape art. The great art direction is complimented well by it’s salutes to the days of old, with it’s retro victory music and mockup CD cover loading screen. Skulls of the Shogun’s story doesn’t dare to take itself seriously, but still manages to be a great companion piece to it’s sometimes brutal gameplay. When General Akamoto is killed in battle just before claiming the title of ‘Shogun’, he is begrudgingly dragged into the Afterlife. You now must guide Akamoto in his slaughterfest through the Afterlife to take back his identity and seek revenge for his death. Now imagine that, but with a consistent barrage of clever dialogue and jokes that assures a great sense of lightheartedness, rather than unnecessary seriousness. 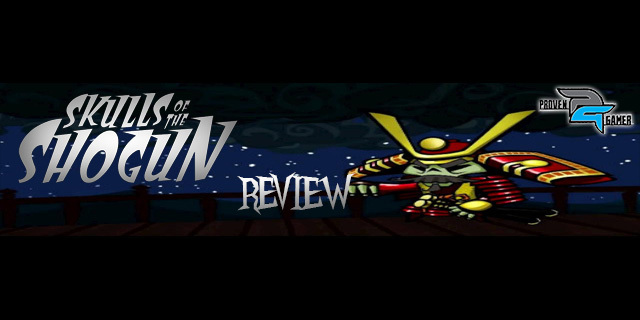 And while Skulls of the Shogun’s visual style and enjoyable story definitely contribute to it being a great package, both would be rendered rather moot if it wasn’t actually fun to play. And as someone who isn’t usually keen on the turn-based strategy genre, SotS’s emphasis on accessible mechanics is very much appreciated. 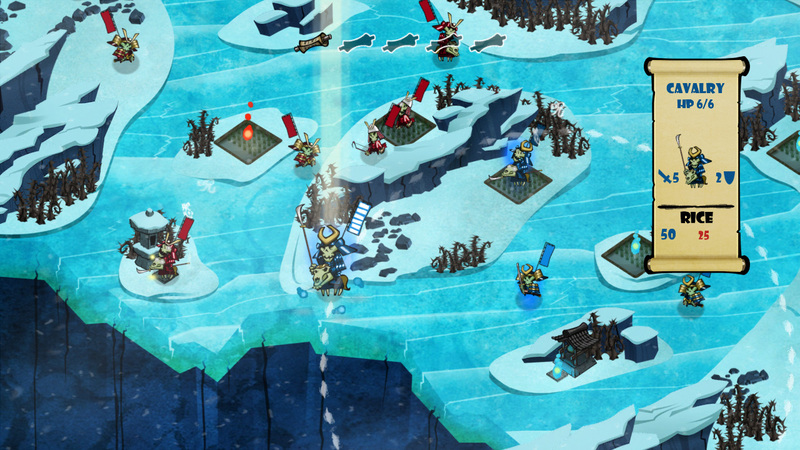 The game is played from a 2D isometric view, with players commanding one General and a multitude of troops made up of several classes. Movement is based upon a unit’s circular radius it can travel, rather than a grid, which helps to make the game less predictable or formulaic. Infantry troops don’t have a large movement radius, but have more attack and defense, while Horsemen can move much farther, but lack the defense to take multiple blows. This is a good example of the game’s balance between units. A large aspect of what makes SotS’s combat a breath of fresh air in multiple ways is the importance of the stage environment itself. 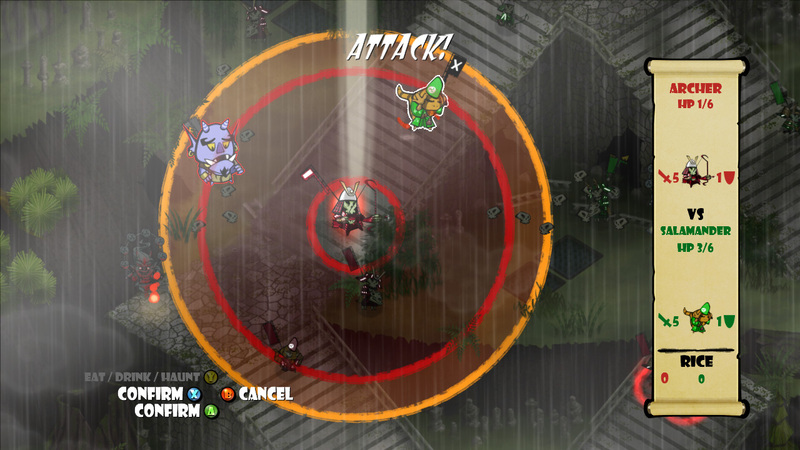 There is knockback when striking enemies, so a unit unfortunately planted on the edge of a cliff can be quickly disposed of, no matter the strength. Depending on the stage, there are rice pads that can be used to build up Rice–currency for purchasing more units–and Shrines used to summon those new units. The medic unit can only be acquired through specific shrines placed throughout stages, and anyone can take over that shrine to steal that medic from another, which can swiftly change the tide of a battle. New mechanics are always introduced at a gradual pace, which is important, because by later levels the game becomes quite deep. Playing effectively later on requires a complete grasp of everything around you, having to develop advanced strategies like deciding what shrines, troops, and medics are worth going after. But what was a constant problem was the lack of consistency between stages. At least for me, there was always a type of story mission that just ‘clicked’ and the type that I would struggle to complete for hours at a time. One of the most valuable things Skulls of the Shogun has in it’s favor is it’s ability to provide the player with all of the information they need at any given time. It’s a feeling similar to last year’s Mark of the Ninja, which made stealth accessible in a way it hadn’t before with smart visual and UI design. SotS organizes it’s interface and menus in this same way to make a deep game accessible. While I was only able to spend time with the Xbox 360 version of Skulls of the Shogun, it is also available on Windows Phone and Microsoft Surface. But even more interesting is the cross-play functionality between Xbox and mobile versions of the game. Opposed to the normal real-time multiplayer to be expected, matches played between Xbox and mobile are played asynchronously. It’s definitely a cool feature, but I don’t really see myself actively checking in on my Xbox to see if it’s my turn to make a move. I don’t often get into a turn-based strategy game—the last being XCOM: Enemy Unknown—because I don’t like feeling overwhelmed with too many options, constantly wondering if I should be doing something differently. 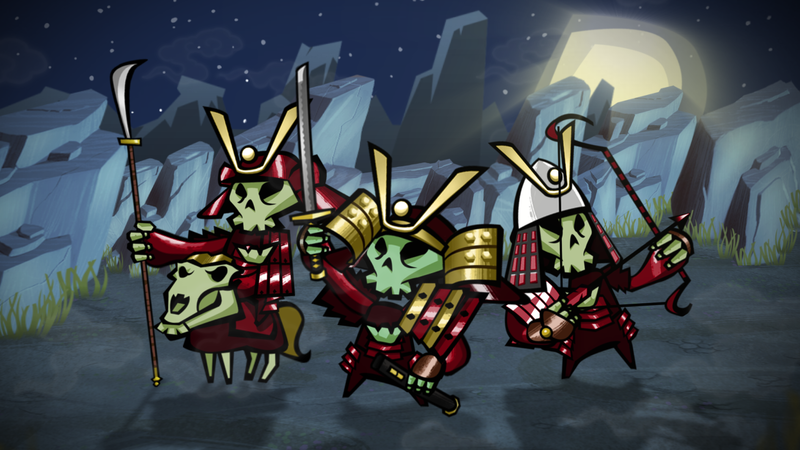 But Skulls of the Shogun definitely helps to ease players into it’s eventually complicated systems. It’s visual presentation directly melds into the gameplay in ways that feel natural. It’s one of the freshest additions to the genre I’ve seen a while, if not a bit inconsistent with it’s difficulty at times. Not only is it an accessible strategy game, but it’s one that could stand up against some of the biggest in the genre.